A system designed specifically for multiroom operation. A large remote control, the Master Control Panel 5000, used a two way infra red system, and worked in the main room and also in any rooms fitted with a two way transceiver, the Master Control Link or Link 82. A smaller one way terminal, the Terminal 5000, was available as an accessory. As the components took the form of three identical units, they could be arranged in many different ways, all to good effect. Two Beocords could be connected, and controlled using the Master Control Panel 5000 if they were Datalink equipped models. Beovox S 55 was an ideal loudspeaker for the main room, whilst Beovox C 40 or C 75 were well suited for additional rooms. Text copyright © Beocentral. Unauthorised reproduction prohibited. 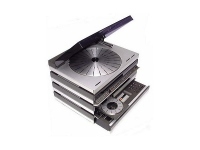 1985: Beogram 5005 replaces Beogram 5000: Beogram 5005 was a thorough redesign of the previous tangential turntables, and was almost identical in appearance to the other components in the system. 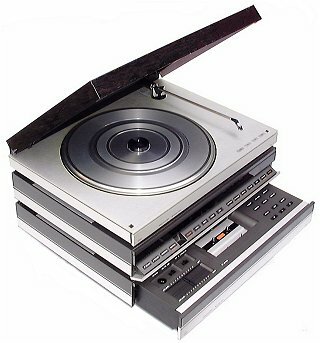 Turntables such as Beogram 8002 worked perfectly as part of Beosystem 5000, but did look a little large and out of place in comparison. The arm of Beogram 5005 could be advanced and returned under remote control, something which was not possible with the previous turntable. Text copyright © Beocentral. Unauthorised reproduction prohibited. 1986: Beogram CD 50 added: The Beogram CD 50 compact disc player was styled to match the system perfectly, and worked properly with even the earliest Beomaster 5000 and Master Control Panel 5000. Text copyright © Beocentral. Unauthorised reproduction prohibited. By this time, new choices were also becoming available for the loudspeakers, Beovox RL 60 for the main room and two new compact models, Beovox CX 50 and CX 100, for additional rooms. Another interesting possibility was the use of the TP2 socket to connect to a Beocord VHS 91 video recorder, which could also be used as a Hi-Fi audio deck. As Beocord VHS 91 was a Datalink equipped model, it could be controlled just like a conventional Beocord using the Master Control Panel. Text copyright © Beocentral. Unauthorised reproduction prohibited.